The bag bears a striking orange and green color scheme that seems to be common to the whole Nativa line. On the back of the bag is a guarantee that â€œthis product is certified organic by an independent third party,â€ and an ingredient list that doesnâ€™t look significantly different from other gummies, other than being organic: corn syrup, cane sugar, gelatin and so forth. Where they differ is that they contain only natural flavors. They have as astringent, almost perfume-y scent that reminds me of a citrus-tasting spice I know Iâ€™ve eaten at Indian restaurants, but canâ€™t put a name to. (Any suggestions?) The flavor is definitely cola-y, with citrus notes and a lot of spice. All in all, Nativa has done a very good job of replicating the (probably mostly artificial) cola â€œflavor experienceâ€ with only natural flavors. The gummies are a little sweeter than Iâ€™d prefer (I always did like the sour ones better), but they do pretty much taste like drinking a flat glass of Coke (well, OK, a store-brand cola). Theyâ€™re very firm in texture, like all gummy cola bottles, and if you want to get the full flavor, you have to chew them up and hold them on your tongue for a bit. 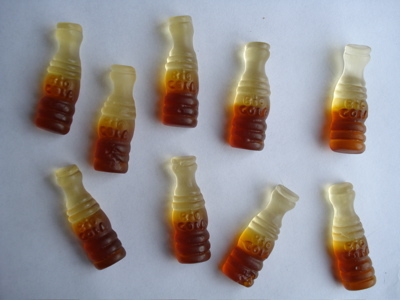 In all, theyâ€™re pretty much a standard cola-bottle experience. So if you like eating organic but are looking for a candy that tastes like you arenâ€™t, these are your gummy. But if youâ€™re on a budget or just not into the whole organic thing, youâ€™ll probably want to stick to the regular (cheap) kind. I recommend a trip to Costco. 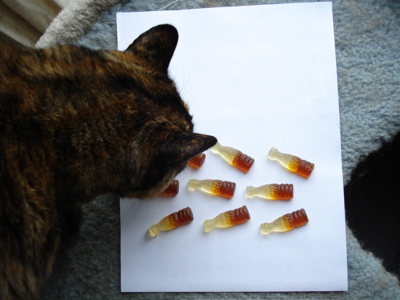 BONUS PHOTO: Why it’s not a good idea to photograph candy on top of the cat’s house, no matter how good the light is there. they look great, I really enjoy cola candy, yet i stopped because i don’t want to eat gelatin, is there gelatin in these ones?? or did they use a substitute? These do have gelatin in them, so they’re not vegetarian friendly. I dont like organic stuff either. 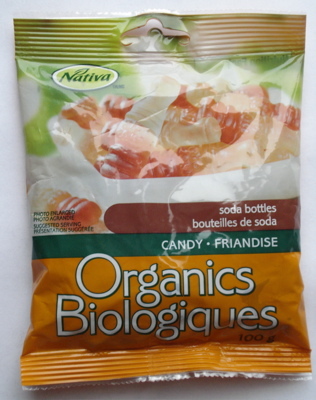 I love Cola Bottle Gummies… but “Biologiques”!?!?!? Would the citrusy spice be coriander? The top half of the ‘bottle’ is meant to be the portion that was already consumed; it’s half empty, if you will.